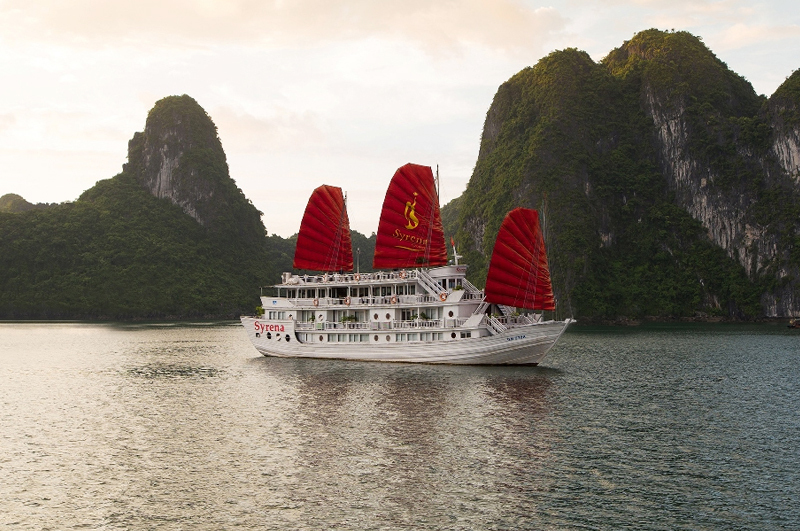 Built in accordance with traditional Vietnamese style and modern-day luxury, Syrena Cruises have maintained the high standards of luxury cruising in Halong Bay. 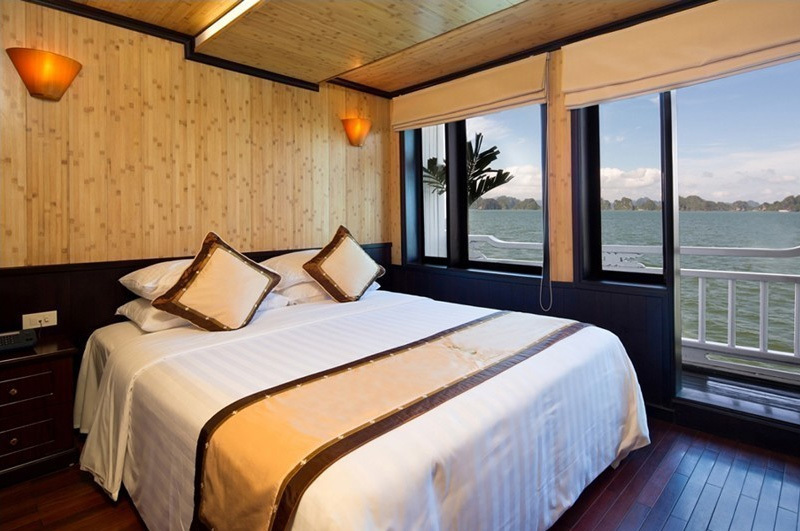 The Syrena Cruises fleet of 2 ships offers a total of 34 luxury cabins & suites accomodating a total of 68 passengers for Halong Bay cruises or hosted events (weddings, corporate retreats, incentives, meetings, conferences, etc.). 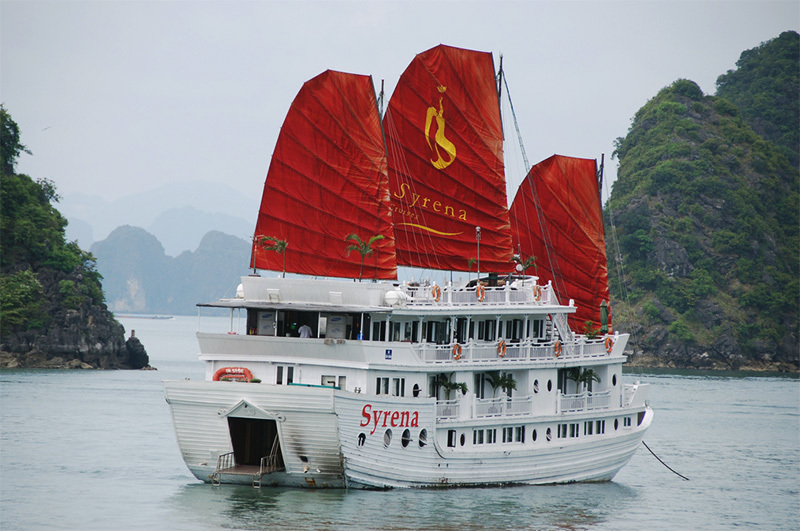 Syrena cruise is built with traditional Vietnamese style and modern luxury, we have two ship with 34 luxury cabin and professional staff. The itinerary 02days / 1night cruise will bring you all the view of Ha long bay, Bai Tu Long, fishing village, Titop Island and many interesting activities on the boat. 8.30 am pick you up at our office in Hanoi then transfer to Ha Long Bay. We embarkation at Syrena Harbor at 11.30. Check in whilst enjoy a welcome drink and cruise briefing. 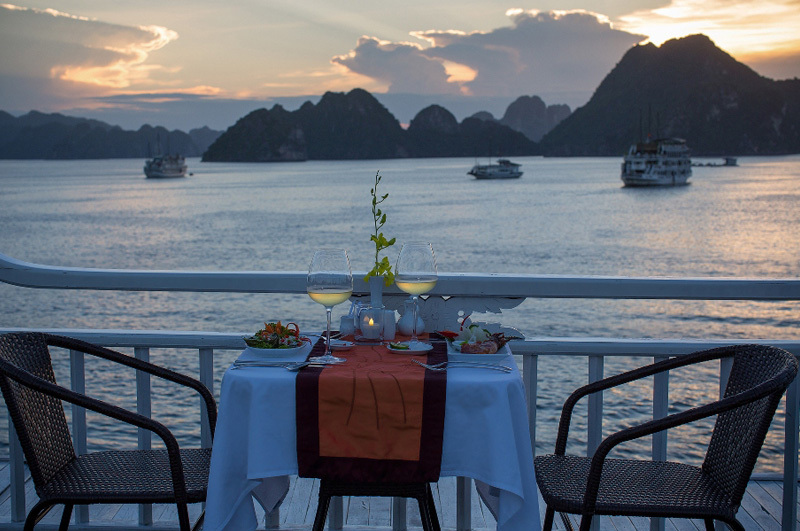 The lunch will be services at 13.00 pm while cruising in the magnificent Bai Tu Long Bay and admiring the fascinating rock formations in the Bay. Cruise to Vung Vieng Floating Fishing Village. 14:30 Arrive at Vung Vieng Floating Fishing Village. Visit the village by a traditionally woven boat rowed by a local boatman for a period of one hour. During the trip, you will meet local people and see the how they live. You will pass through floating houses of 40 families, floating information central and pearl farm with shops. 15:30 Back to the cruise and continue cruising to the Titop Island. 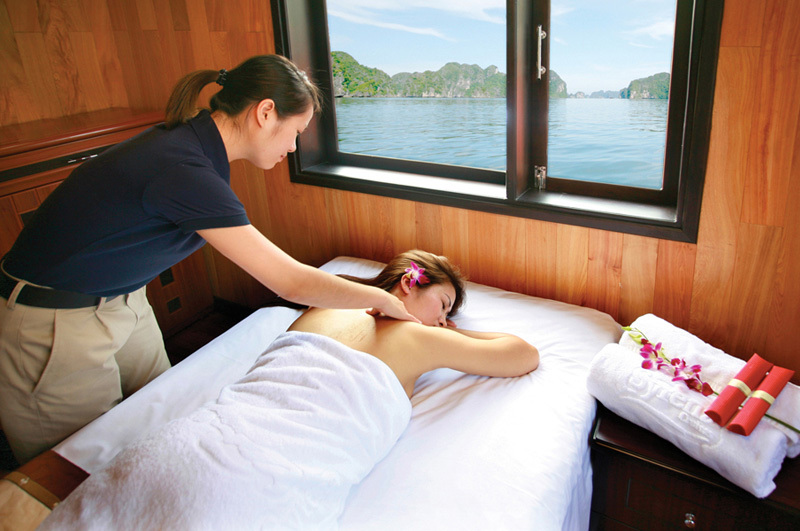 Chargeable foot reflexology and massage services are available on the cruise. Please book the service with our cruise team. 16:30 Arrive at Titop Island. There are 2 programs to choose from. The 1st option is a 45 minute chargeable kayaking program to the nearby Luon Cave and surrounding waters. The 2nd option is to visit the Titop Island. Enjoy swimming and relaxing on the beach. Towels will be supplied. Alternatively you can climb the stone steps to the top of the island for taking photos and enjoy the view. We will spend about 45 minutes on this island. 17:15 Back to the cruise and relax on board. 18:00 Enjoy cooking demonstration on the sun deck. Guests can try how to make the Vietnamese traditional dishes. HAPPY HOUR within 01 hour – BUY ONE GET ONE FREE (wine excluded). 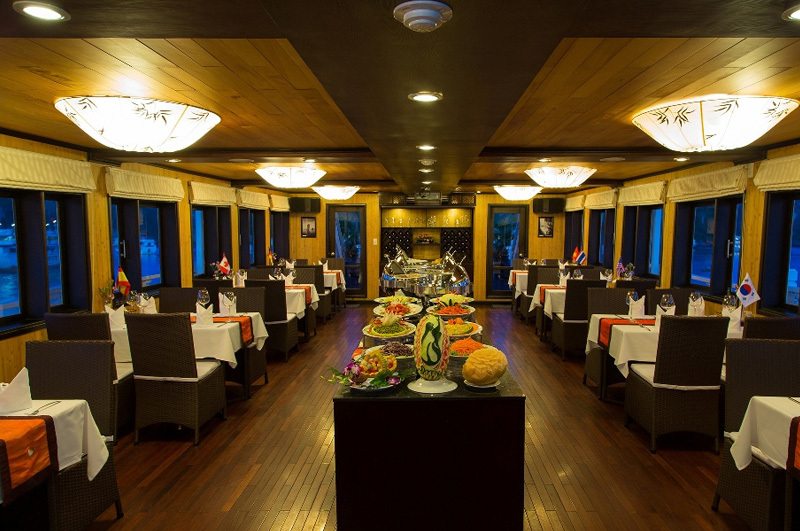 19:00 Dinner is served with a variety of Vietnamese and fusion cuisine. 20:30 Evening activities include: Movie entertainment in the dining room at about 21:00. Board and card games are accessible or join the squid fishing on board with our crew. Chargeable foot reflexology & massage services will also be available. Please book the service with our cruise team. 21:00 Enjoy HAPPY HOUR within one hour – PAY 2 GET 1 FREE (wine excluded) on the sun deck or in the restaurant’s bar. Bar is open until 23:00. 23:00 We will then cruise to our overnight anchorage near Trong Cave or Titop Island. 06:00 Enjoy Tai Chi instructions on the sun deck in 30 minutes then have coffee, tea and pastries will be served in the dining room. 07:30 we will visit the Surprise Cave. Walk up 100 steps to the entrance of the cave and tour around for approximately 45 minutes. 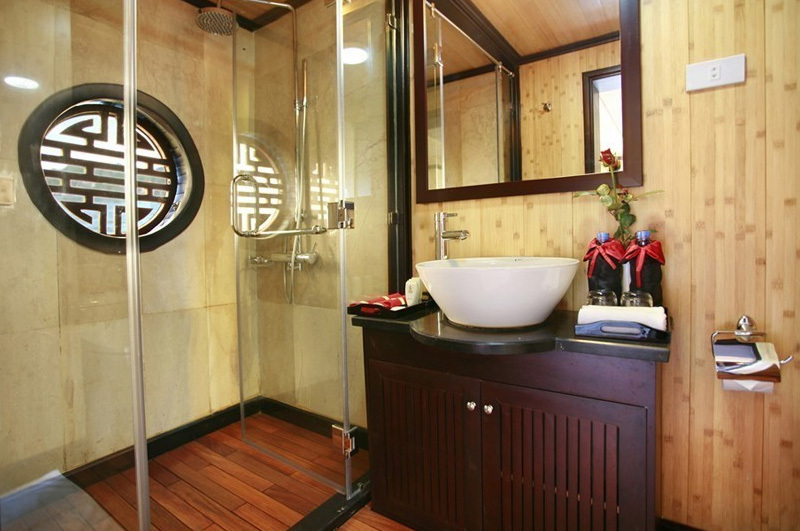 08:45 Upon return to the cruise, take time to freshen up and check out of the cabins. Please leave your luggage outside of your cabins. Our staff will transfer your luggage to the pier upon arrival. Depart for Syrena pier. 09:15 Enjoy brunch or set menu served in the dining room. Settle bills in the dining room after brunch. 10:00 Relax on the sun deck or in the dining room and enjoy the bay scenery as we approach the pier. 11:00 Arrive at Syrena pier. Then bus pick up and transfer to Hanoi. We arrive Hanoi around 16.30 pm. 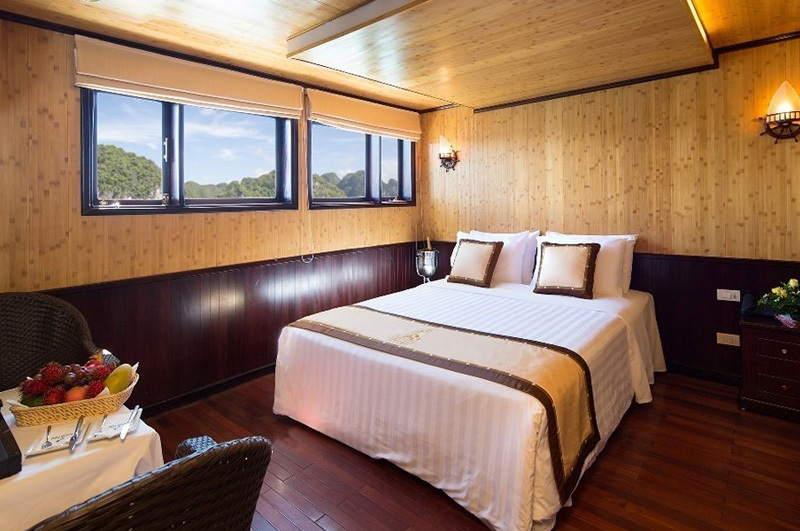 Syrena cruise is built with traditional Vietnamese style and modern luxury, we have two ship with 34 luxury cabin and professional staff. 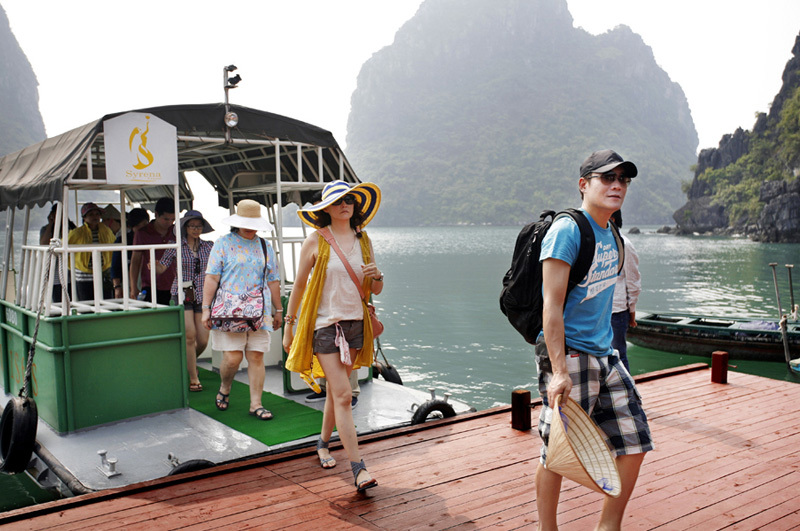 The itinerary 03days / 2nights cruise will bring you all the view of Ha long bay, Bai Tu Long, fishing village, Titop Island, caves and kayaking around Titop Island. 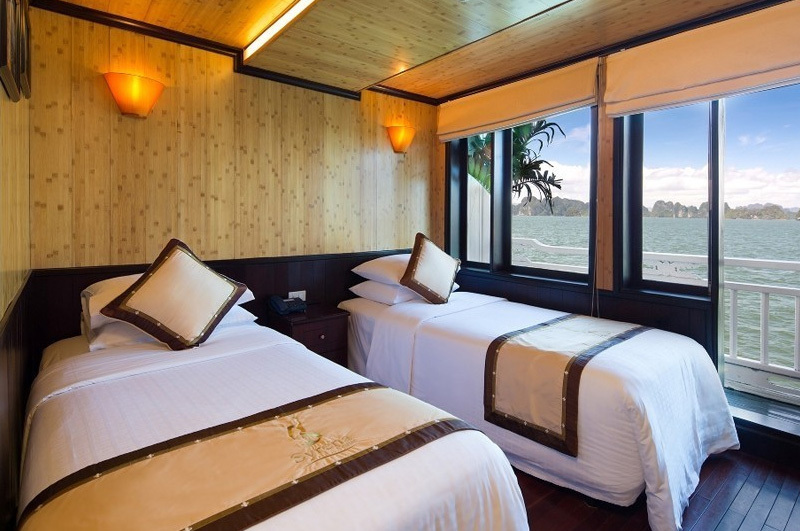 We will bring you a happy time in Ha Long bay with this package 3days/2nights. 08.30 am pick you up at our office in Hanoi then transfer to Ha Long Bay. We embarkation at Syrena Harbor at 11.30. Check in whilst enjoy a welcome drink and cruise briefing. 14:30 Visit Vung Vieng floating Fishing Village. Visit the village by a traditionally woven boat rowed by a local boatman for a period of one hour. During the trip, you will meet local people and see the how they live. You will pass through floating houses of 40 families, floating information central and pearl farm with shops. 15:45 Back to the cruise and continue cruising to the Titop Island. 16:45 Arrive at Titop Island. Enjoy swimming, relaxing on the beach or climb the steps of the Rock to the top of the island for taking photos. After visiting Titop, guests can book 45 minute chargeable kayaking program with the cruise team. 17:30 Back to the cruise and relax on board. 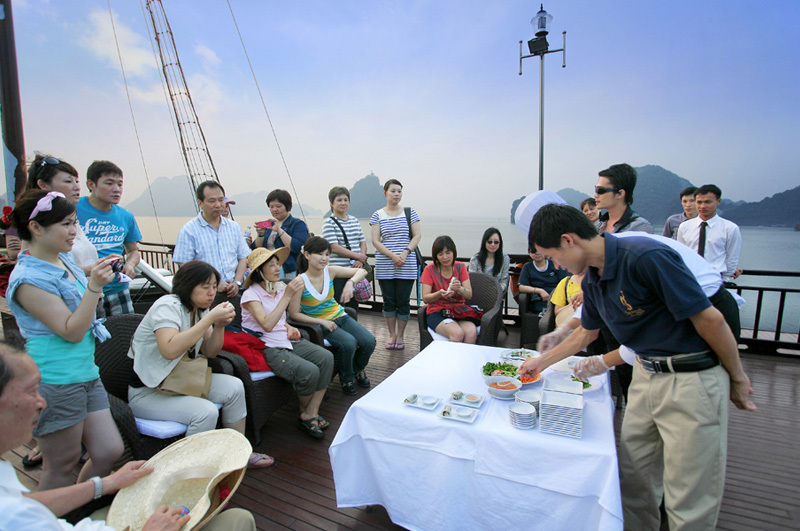 18:00 Enjoy cooking demonstration on the sun deck. Guests can try how to make the Vietnamese traditional dishes. HAPPY HOUR within one hour – BUY ONE GET ONE FREE (wine excluded). 19:00 Enjoy a variety of Vietnamese and fusion dishes in the dining room. 20:30 Evening activities include: film entertainment in the dining room at about 21:00, squid fishing on boat with our crew. Board and card games are accessible. Chargeable foot reflexology & massage services will also be available. Please book the service with our cruise team. 23:00 Overnight anchorage near Titop island. 06:30 Enjoy Tai Chi instructions on the sun deck in 30 minutes then enjoy breakfast served in the dining room. 09:00 we visit Sang cave & Toi cave or in case of unfavorable weather condition, we will explore Me Cung cave and swim on Soi Sim beach. 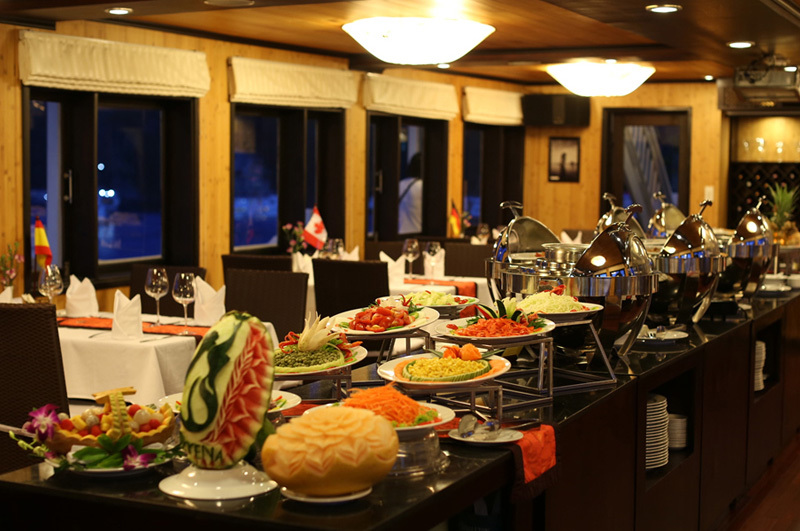 12:00 Enjoy Set Lunch on board with Halong Seafood. 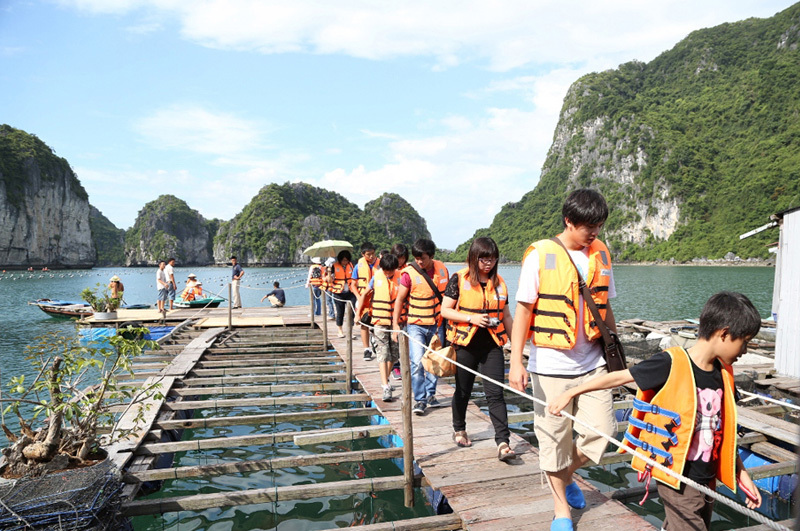 14:00 Visit Luon Cave by sampan boat to see monkeys. 16:00 Back to Syrena Cruise. 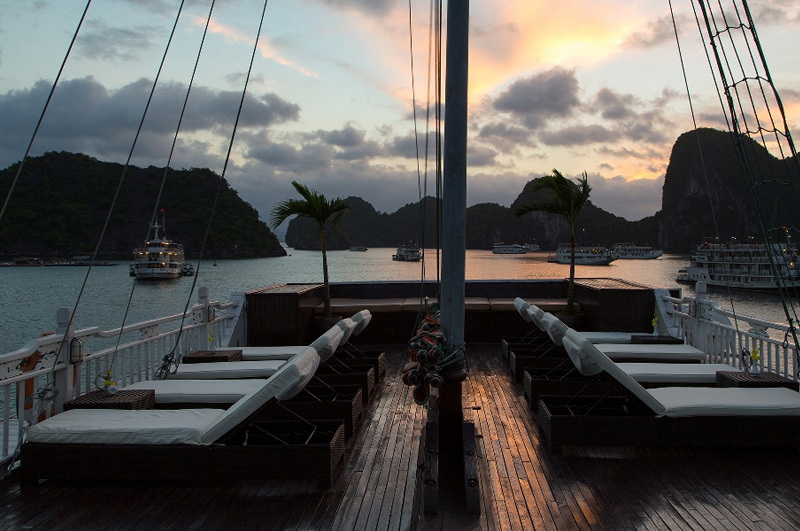 Relax and enjoy sunset on the sun deck. Chargeable foot reflexology and massage services are available on board. Please contact our cruise team to book the service. 18:30 Food carving demonstration will be on the sundeck. Guests can try how to prune flowers by vegetables. HAPPY HOUR within one hour – BUY ONE GET ONE FREE (wine excluded). 19:00 Enjoy Buffet Dinner with a variety of Halong seafood and Vietnamese cuisine. 20:30 Evening activities include: film entertainment in the dining room, squid fishing on boat with our crew, board and card games. Enjoy HAPPY HOUR from 21:00 – 22:00 – PAY 2 GET 1 FREE (wine excluded) on the sun deck or in the restaurant’s bar. Bar is open until 23:00. 23:00 Overnight anchorage near Trong Cave. 06:30 Enjoy morning Tai Chi Class on the sun deck. Then enjoy early breakfast with coffee, tea and bakeries. 7:45 Transfer by tender to visit the Surprise Cave – one of the most beautiful cave in Halong Bay. Walk up 100 steps to the entrance of the cave and tour around for approximately 45 minutes. 09:00 Back to the cruise and relax on board. Check out of cabin. Relax on the sun deck or in the dining room enjoying the bay scenery as we approach the pier. 09:15 Farewell Brunch. 10:45 Disembarkation. Then bus pick up and transfer to Hanoi. We arrive Hanoi around 16.30 pm. 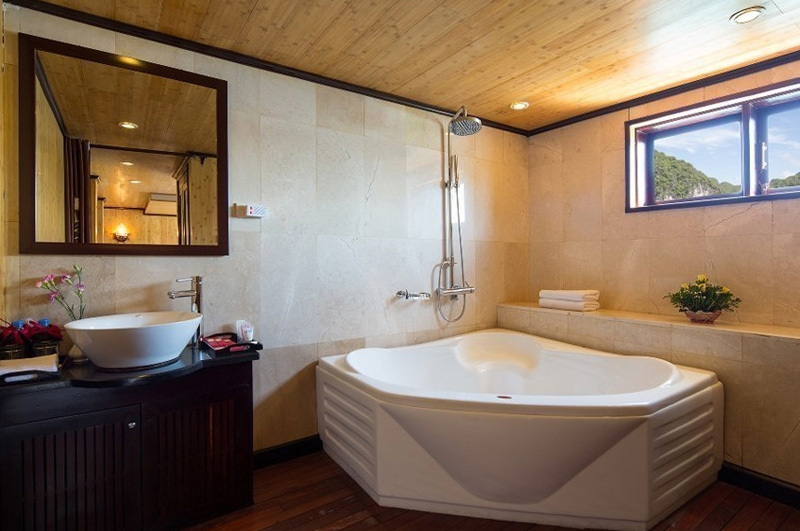 Deluxe Private Balcony Cabin (15m²) offers all the amenities necessary: twin beds or a queen-size bed, air-conditioner, en-suite bathroom with shower. Besides, each cabin features a private balcony with table and chair, providing a relaxing place for you to enjoy the magnificent bay view as well as to savor a private breakfast or afternoon tea.